Also known as the devilfish because of the large cephalic fins on either side of its gaping mouth that look like horns, it actually got its name from the Spanish word for a mantle or a cloak. This species of ray that is related to the shark can grow to the enormous width of 23 feet from wing tip to wing tip. It is a peaceful species of sea life that feeds on the zooplankton it scoops up as it glides gracefully along through the depths. The great white shark, killer whales, and man are its only predators, and man is the worst of the three, through overfishing. Some countries, like China, hunt the manta to harvest the filter rakes in its mouth, which they use for medicinal reasons. Mantas are not on the endangered species list, but have recently been added as a “vulnerable” species because the gestation period of the manta is twelve months long and will only produce one or two pups at a time. If unhindered, the manta can live to approximately 50 years of age in the tropical or subtropical waters that they inhabit around the globe. In the town of Puerto Lopez there are several tour companies that provide tours of the nearby island of Isla de la Plata, which is a nature preserve, and will take tourists on diving tours in the beautiful azure waters of the Pacific. 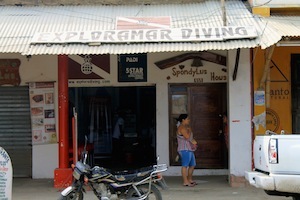 One of these companies is called Exploramar Diving and is owned by a PADI certified diving instructor who also happens to be a marine biologist named Michel Guerro. He speaks excellent English and is exceptionally passionate about the study of the mantas that migrate to these waters to reproduce. He has made several videos of their habits, including their magnificent mating displays of breaching the water’s surface. He has been studying them for several years and has tagged individuals with radio transmitters to track their migratory journeys around the world. When taking a diving tour with Michel, a person will have the opportunity to swim with these incredible creatures in a silent ballet, gliding along with these gentle giants. The contact information for Michel and Exploramar Diving is: Calle Alemania N32-71 y Av. Mariana de Jesus, P.O. Box 1717 1295, Quito-Ecuador; (593) 2 256 3905. Michel and many of his fellow marine biologists from around the world are fighting to preserve this magnificent creature from extinction. It is because the manta is so long-lived, with a low reproduction rate, that its population is in danger of being reduced by careless human overfishing. Michel helped to organize the Proyecto Mantas Ecuador (Project Mantas Ecuador), which was created to research, protect, and conserve the large populations of manta rays along the Ecuadorian coastline. Through their work, the giant manta has been recommended to be listed on Appendix I and Appendix II of the convention for the Migratory Species Act, showing that it is a threatened species in need of conservation and protection. Anyone who desires to help in this fight for this noble species can contact the project at: Proyecto Mantas Ecuador, Alemania N32-71 y Mariana de Jesus, zip code: EC170147, Quito-Ecuador; (593) 2 256 3905; fax: (593) 2 256 4342; cell: (593) 9 950 0910. You can help keep the giant manta from being driven into extinction so that the generations of the earth’s population after us can appreciate this fantastic sea creature. If you need more convincing, then travel to the beautiful port city of Puerto Lopez and dive amongst them yourself. I’m sure Michel would be only too happy to make the introduction.